Olive oil makes a rich and creamy soap. Are you wondering how to make olive oil soap? Fortunately, making this pampering beauty treatment is easier than you might think. Instead of paying sky-high prices for fancy soap at your local department store, you can create affordable olive oil soap in the comfort of your home. Olive oil soap, also known as Castile soap, has a long history. In fact, many people believe olive oil soap originated in Spanish Kingdom of Castile as early as 1567. Olive oil soap is created by mixing olive oil with lye, then adding colors and fragrances. Some people also like to add moisturizers such as glycerin to their homemade olive oil soap. Although it is slower to lather than other types of soap, olive oil soap is very mild. This makes it a great choice for people with allergies or sensitive skin. When learning how to make olive oil soap, it's important to understand what qualities are desirable in the oil you choose. 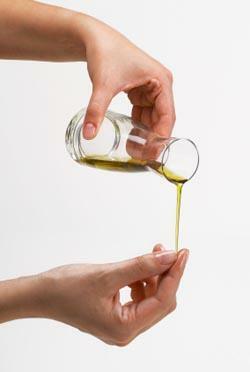 Although high grade olive oil is recommended for cooking, a lower grade oil actually makes better soap. Lower grade oils work better for saponification and are also more cost effective. Instead of searching for extra virgin olive oil, look for products labeled as pure or pomace grade.Since the olive oils used for soap making are edible, you can generally find supplies for your project at your local grocery store. If you are planning to make a large quantity of soap as part of your home-based craft business, however, Olive Oil Source allows you to purchase olive oil in bulk. Olive oil soap is made using the cold process soap making method. If you are unfamiliar with this technique, you can find a tutorial on the From Nature with Love Web site. For the recipe listed above, you would add between 1.5 and 2.2 ounces of fragrance or essential oil to create a scented soap. Chamomile is a popular choice for making olive oil soap, although you can feel free to experiment and create your own unique scent blends. If you wish to add dried herbs to your soap, lavender, patchouli, or rosemary are great choices. Simply sprinkle a small handful into each mold.